Connecting Oakridge and the Willamette Valley to Central Oregon, Bunchgrass Ridge has long been an important travel route for indigenous people, early settlers, and now people enjoying the forest on two wheels, two feet, or four hooves. The OTTA is rebuilding the final few miles of sub alpine singletrack connecting Bunchgrass Ridge to Fuji Mountain. Join us as we make history. Klamath Tribes would use the route to trade with the Molalla and Kalapooya tribes. The Kalapooya used the ridgeline as their summer hunting and foraging grounds and would start controlled burns to ensure the bunchgrass meadows were not encroached upon by the surrounding stands of old growth Douglas fir, Western Red Cedar, and Western Hemlock. In the early 1900’s sheep herders used these same meadows to graze their flocks and eventually the present-day Bunchgrass Trail was built as a pack and saddle supply route for the Fuji Mountain fire lookout, erected in 1928. By the 1960s the United States Forest Service (USFS) had begun to reduce their inventory of fire lookouts and removed Fuji Mountain’s structure in 1968. In the 50 years since, Bunchgrass Ridge Trail has transitioned into primarily a backcountry recreation resource. Hikers, mountain bikers, equestrians, hunters, and ultra-endurance runners all traverse its scenic slopes—but rarely, and the current state of the trail shows this lack of attention. The Oregon Timber Trail Alliance (OTTA) is especially cognizant to the growing popularity of bikepacking, and sought backcountry experience of riders. These riders are coming to Oregon from all over the world because they desire extended trips through remote and pristine landscapes, such that Bunchgrass Ridge offers. 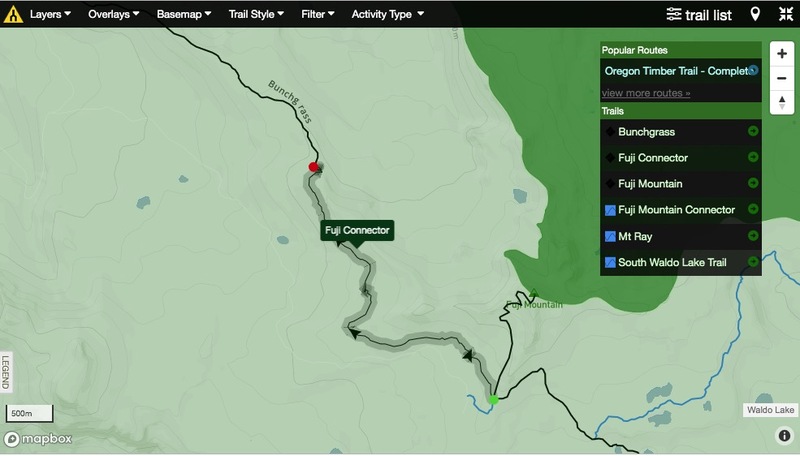 The OTTA is committed to preventing the Bunchgrass Ridge Trail from further fading into obscurity and improving its usability and connectivity. Bunchgrass Trail terminates 1.8 miles from Fuji Mountain where a trail comes up its opposite face leads to the summit. Bunchgrass Trail users currently must descend elevation on forest roads only to climb it again to link to Fuji Mountain and other trails networks in the cascade lakes region. The Oregon Timber Trail Alliance, along with other user groups in the Oakridge community see great value in re-building this lost pack and saddle route to the Fuji Mountain Summit. If you’re familiar with our typical Stewardship Campout this build party will be a bit more self-sufficient. While we’re providing coffee & beer, we’re expecting you to bring most of of your own food. And feel free to bring enough to share—we’ll have a grill station set up. NO EXPERIENCE REQUIRED - That's right, we just need a smile, a pair of gloves, and a good attitude from you. Our goals for this event will be focused primarily on logging and brushing out the trail corridor and scratching the rough trail alignment in the duff. Put those sawyer skills to use! Or, if you're interested in boosting your tread building skills check out our Backcountry Builder Course on April 27-28. That being said, no experience is required: there’s plenty of work to be done and that’s the best way to learn. GETTING THERE - The roads to base camp will be passable by all passenger vehicles. There is NO cell reception so carry paper maps. It's about a 3.5 hour drive from Portland. We will be camped at a small lake off of NF387, approximately 8.2 miles up the Eagle Creek Drainage north of Hwy 58. Driving directions are here. LOGISTICS - Although it’s mid summer, we're camping at 5,500k' and temperatures may be chilly at night. The days will likely be warm and mosquitos plentiful. There is no cell service. There is no potable water. Our partners at Base Camp Brewing and Stumptown Coffee have generously supplied us with coffee and beer. Nearest fuel and services are 45 minutes away in Oakridge, Oregon. YOU SHOULD BRING - Tent, sleeping bag, pad, extra toilet paper, lots of water, cooking gear, food, and a camp chair. 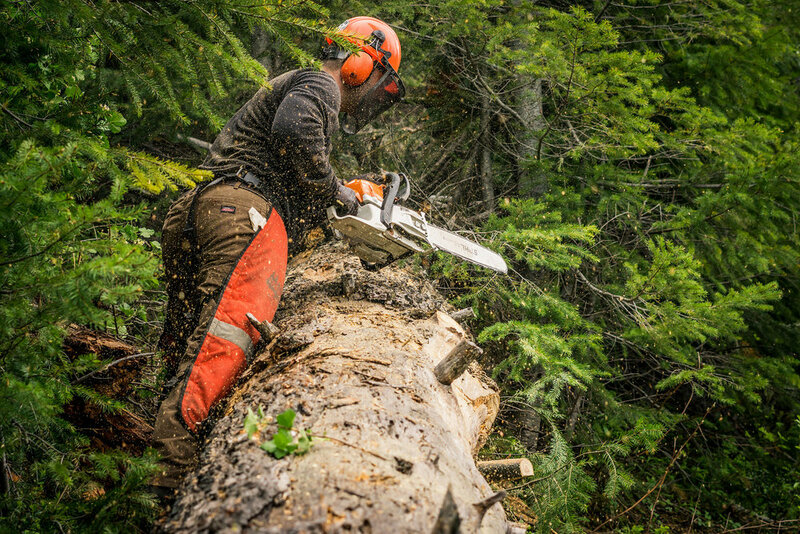 During the work day Personal Protective Equipment (PPE) is required to work on public lands; this includes a 6-point suspension helmet (some loaners provided), eye protection, gloves, long pants, long sleeve shirt, and sturdy shoes/boots. Bring a pack, with water, snacks, mosquito repellant, and sunscreen each day as well. If you have a large pack, consider bringing it as the trails are steep and rugged and getting tools to where they're needed will be a challenge. And don't forget your bike riding gear—we'll make sure there's some time to ride if you're not too exhausted at the end of the day. WEATHER - Night time temperatures may be chilly in the low 40s. Day temps will likely be warm and there’s always a chance of rain in the Cascades. This is going to be a fun event working, camping, and riding in some of the coolest terrain Oakridge has to offer. We're excited and grateful that you're spending a valuable summer weekend giving back to our public lands. On behalf of the Oregon Timber Trail Alliance and the Willamette National Forest a huge thanks goes out to everyone lending a hand at this exciting trail building event.